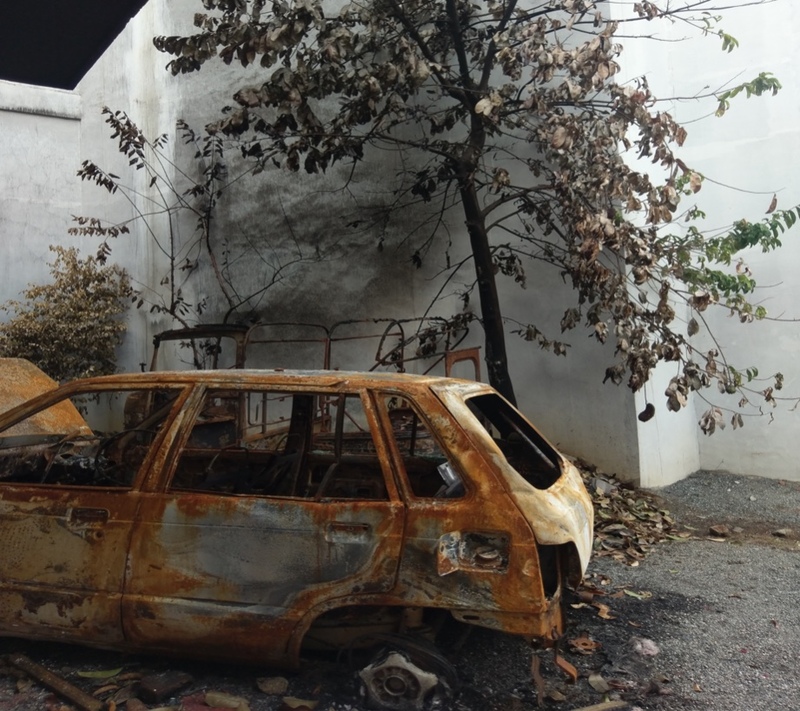 An attempt to flesh out and give voice to the numbers and figures we have at hand of the recent anti-Muslim violence unleashed in the Hill Capital; through a collection of narratives and images of the affected Welekade area of Kandy district. I walked into a pocket of Muslim houses in a village in the district of Kandy with a tiny voice in my head seeking for splinters of something to hold on to as hope; amid the burnt homes and livelihoods. It seemed almost unnatural and unforgivable that I had sought so. For what I encountered, beyond the scenes of destruction, was a bitter cry far more critical and sad. It was evident we have, as a community and as a country, passed the threshold to yet another mayhem of misery and impending bloodbath – if matters are left unchecked. It felt as if a finite period of “state of emergency” had dawned among the Muslims and the other communities in this country, who wish to live in peace. “After burning the vehicle parked in the front, they burnt the small children’s bicycle. 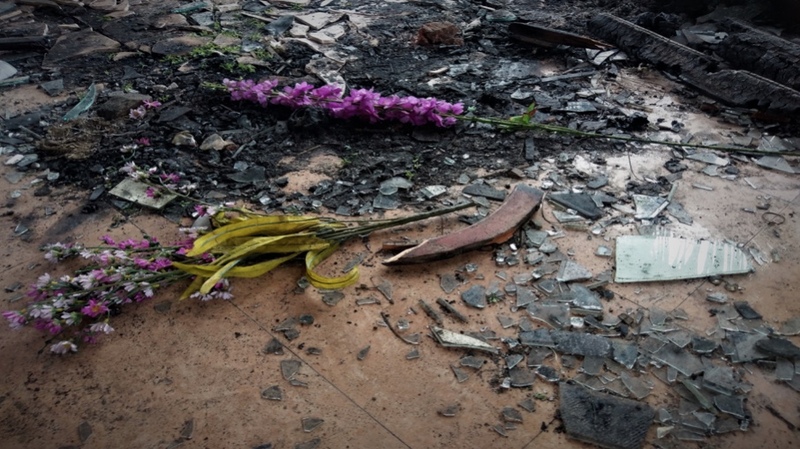 They even broke the children’s toys…what kind of beings were they?” A resident of the affected area wondered in dismay. “Only our clothes are different, everything else is the same….,” the first woman I spoke to from the affected area began the conversation thus. The Temple and the Mosque lay within a 100 odd meters’ distance on either side of the main road. My first instinct as we entered the area was to think like the many reports I read online, perhaps this community too had worked together to prevent the violence. However, when we had spoken to some of the residents it became clear that the attacks on this community was very much unexpected. It happened on the morning of 7th of March, almost two days after the initial attacks in the Teldeniya and Digana areas. The elderly woman I first spoke to continued to provide her own account of the attacks. 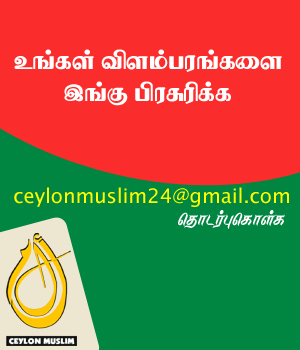 She also stated that a Sinhala woman took so many of these women into her house and sheltered them during the attacks. However it was sad to see that a shadow had fallen on the state of ‘normalcy’ that these communities experienced and their relations with each other. “There were no issues between us previous to this. But nobody came to us to at least to say a word of consolation. We are yet to meet them face to face. I do not know what they will say now. But before, whenever we see each other we speak referring to one another “akka”.” , her voice trailed on with hurt and acknowledgement of the more than physical damage this violence has brought on. A recurring image in my thoughts are the words and the sight of a small school boy whose house was completely brought down by the arson attacks. When they had heard the on-coming mobs, he said he fled the house with his elder sister and their younger brother; their mother had passed away some time ago and their father was at the hospital undergoing a major surgery at the time of the attacks. Standing on the wreckage, fighting the brimming tears while trying to be the ‘man’ of what was now the skeleton of a house; he related using the past form “Dhatha da kalyaanatha next month wechirunthom – we had planned to have our elder sister’s wedding next month”. 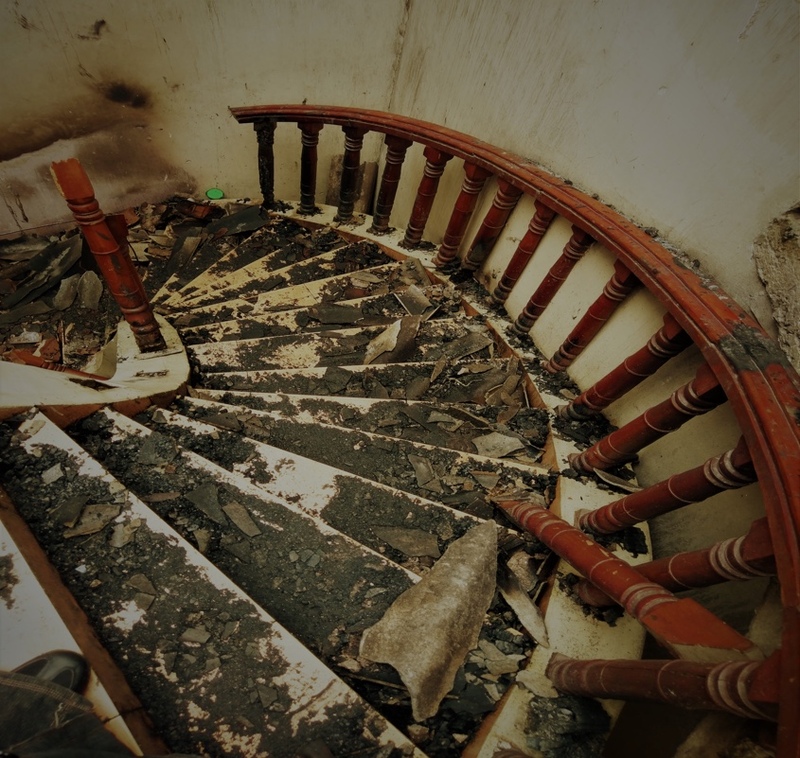 It took me some effort to descend those broken steps and leave him alone there; in the backdrop of his devastated house. One of the women we spoke to said how they had to return to the partially broken house a few days after the attacks; because her ten year old daughter had started to fear that they have become refugees. She said “My daughter kept asking me, “Umma are we refugees now? Have they burnt all my books too?” She is already very frightened. I did not want her imagination to traumatize her further, so we came home after repairing the broken doors and windows with wood and cardboard.” Fortunately their house had not come under arson attacks. Windows/doors of a completely destroyed house and the views through the scorched frames. A mother recalled with tears. “We left like orphans, my daughter’s three month old baby, just with the piece of cloth on her, we ran. They took us to protection, to our relative’s places in interior areas.” She went on to say that those men in uniform protected her and her young daughters from harm but their properties, vehicles and so on were burnt or destroyed. She wondered when and how that happened, since the STF/army were already present. Most of them could not identify or differentiate who were the forces that was deployed to protect them. It appears that they simply trusted these men in uniforms to be a source of protection from the mobs. However, when the residents had returned, they were met with destruction and loss of houses and properties. One woman who had also fled the scene narrated that “We did not even have a moment to lock the doors. They said “api balagannang, api balagannang – we will take care, we will take care”. But when we came back; we don’t know what they took care of.” I wonder if my translation of her statement does justice to what she exuded in speech; she did not say this in anger or rage, she sounded sad. Profoundly, sad. For I saw, many of them heaved a sigh of relief and were grateful to the ‘men in uniforms’ for saving them from bodily harm or loss of lives but they expressed a deep sense of betrayal and loss. 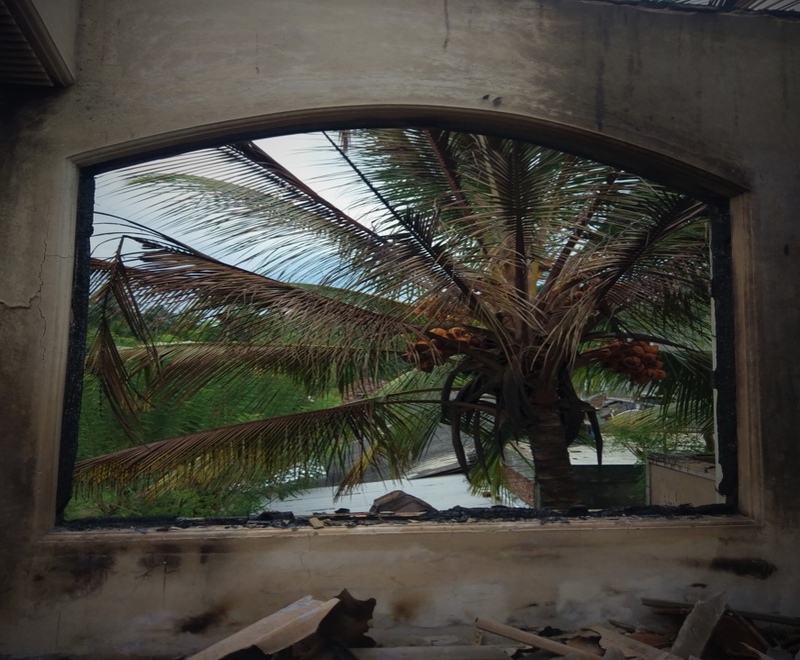 A woman we spoke to related that a mother and her one and half year old baby were rescued from their burning house by a Sinhalese woman in the neighbourhood. Apparently the neighbour woman, with the baby in her arms had fallen on the ground begging the mobs, not to attack this house and that they are “hondha minissu – good people”. What was left of the house told us those cries had gone unheard. Like what we learn from history, flames that went up in this incident consumed so much. However, contrary to how some media depict this as a clash between two different religious communities; by nature and execution in plain sight it was a wave of violence unleashed upon unarmed civilians by mobs with the seeming blessings of the powers that be. It was painful to see what they had lost in their hearts and minds were more than what they had lost in material. The frames through which these people viewed their lives were burnt most brutally and, yes, systematically. This could be a shared feeling in other Muslim communities across the Island too, for whom once again, recent history has repeated itself. But this is also the scorching of the frames for many Sri Lankans for whom this land and peaceful life in it are priceless. What I can infer from all this is that this recent violence is yet another devastating reminder of what and how we are performing as a country. The demons that haunt our “post-independence” and “post-war” lives have come out in blatant day light. In the midst of rebuilding houses made of bricks, cement, wood and more – would we be able to rebuild the ‘homes’ and make this Island a home again to many of its citizens; who have lost that sense, not merely in this recent March 2018 anti-Muslim violence but way before due to many different forms of violence and marginalization? Most of the women we spoke to prayed that “Something like this should never happen, not to anyone. Never.” But are we a community, communities and a country, ready to entertain just such prayers and hopes?